Man Made Filament yarn like Polyester & Nylon are comfortably twisted on this machine. Its vibration free balanced spindle having hard anodised / S.S. pot gives long lasting performance. 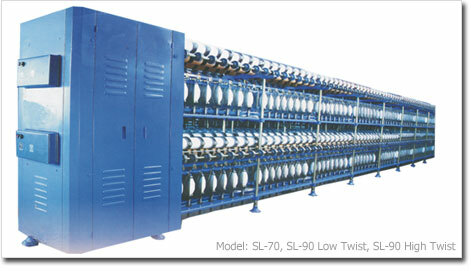 Spindles ø 60, ø 70, ø 90 pot are given as per requirement. Aluminium cops having different length viz. 210 mm, 240 mm, 270 mm are used as a feed package. High Speed upto 14000 rpm.